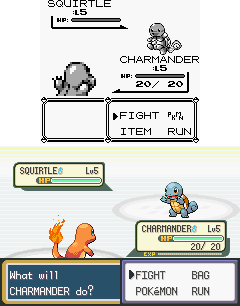 Pokémon Red and Blue for the Game Boy (top) were remade for the Game Boy Advance as Pokémon FireRed and LeafGreen (bottom). A video game remake is a video game closely adapted from an earlier title, usually for the purpose of modernizing a game for newer hardware and contemporary audiences. Typically, a remake of such game software shares essentially the same title, fundamental gameplay concepts, and core story elements of the original game. Remakes are often made by the original developer or copyright holder, sometimes by the fan community. If created by the community, video game remakes are sometimes also called fan game and can be seen as part of the retrogaming phenomenon. A remake offers a newer interpretation of an older work, characterized by updated or changed assets. A remake typically maintains the same story, genre, and fundamental gameplay ideas of the original work. The intent of a remake is usually to take an older game that has become outdated and update it for a new platform and audience. A remake may also include expanded stories, often to conform to the conventions of contemporary games or later titles in the same series in order to make a game marketable to a new audience. For example, Sierra's 1991 remake of Space Quest, the developers used the engine, point-and-click interface, and graphical style of Space Quest IV: Roger Wilco and The Time Rippers, replacing the dated graphics and text parser interface of the original. However, elements that had not become dated, like the narrative, puzzles, and sets, were largely preserved. Another example is Black Mesa, a Half-Life 2 mod that improves in-game textures, assets and models, and facial animations, while taking place in the events of the original Half-Life game. Games that use an existing brand but are conceptually very different from the original, such as Battlezone (1998) and Defender (2002) or Tomb Raider (1996) and Tomb Raider (2013) are usually regarded as reboots rather than remakes. A port is a conversion of a game to a new platform that relies heavily on existing work and assets. A port may include various enhancements like improved performance, resolution, and sometimes even additional content, but differs from a remake in that it still relies heavily on the original assets and engine of the source game. A port that contains a great deal of remade assets may sometimes be considered a remastering or a partial remake, although video game publishers are not always clear on the distinction. In the early history of video games, remakes were generally regarded as "conversions" and seldom associated with nostalgia. Due to limited and often highly divergent hardware, games appearing on multiple platforms usually had to be entirely remade. These conversions often included considerable changes to the graphics and gameplay, and could be regarded retroactively as remakes, but are distinguished from later remakes largely by intent. A conversion is created with the primary goal of tailoring a game to a specific piece of hardware, usually contemporaneous or nearly contemporaneous with the original release. An early example was Gun Fight, Midway's 1975 reprogrammed version of Taito's arcade game Western Gun, with the main difference being the use of a microprocessor in the reprogrammed version, which allowed improved graphics and smoother animation than the discrete logic of the original. In 1980, Atari released the first officially licensed home console game conversion of an arcade title, Taito's 1978 hit Space Invaders, for the Atari 2600. The game became the first "killer app" for a video game console by quadrupling the system's sales. Since then, it became a common trend to port arcade games to home systems since the second console generation, though at the time they were often more limited than the original arcade games due to the technical limitations of home consoles. In 1985, Sega released a pair of arcade remakes of older home video games. Pitfall II: Lost Caverns was effectively a remake of both the original Pitfall! and its sequel with new level layouts and colorful, detailed graphics. That same year, Sega adapted the 1982 computer game Choplifter for the arcades, taking the fundamental gameplay of the original and greatly expanding it, adding new environments, enemies, and gameplay elements. This version was very successful, and later adapted to the Master System and Famicom. Both of these games were distinguished from most earlier conversions in that they took major liberties with the source material, attempting to modernize both the gameplay as well as the graphics. Some of the earliest remakes to be recognized as such were attempts to modernize games to the standards of later games in the series. Some were even on the same platforms as the original, for example Ultima I: The First Age of Darkness, a 1986 remake of the original that appeared on multiple platforms, including the Apple II, the same platform the source game originated on. Other early remakes of this type include Sierra's early-1990s releases of King's Quest, Space Quest and Leisure Suit Larry. These games used the technology and interface of the most recent games in Sierra's series, and original assets in a dramatically different style. The intent was not simply to bring the game to a new platform, but to modernize older games which had in various ways become dated. With the birth of the retrogaming phenomenon, remakes became a way for companies to revive nostalgic brands. Galaga '88 and Super Space Invaders '91 were both attempts to revitalize aging arcade franchises with modernized graphics and new gameplay elements, while preserving many signature aspects of the original games. The 16-bit generation of console games was marked by greatly enhanced graphics compared to the previous generation, but often relatively similar gameplay, which led to an increased interest in remakes of games from the previous generation. Super Mario All-Stars remade the entire NES Mario series, and was met with great commercial success. Remake compilations of the Ninja Gaiden and Mega Man series followed. As RPGs increased in popularity, Dragon Quest, Ys and Kyūyaku Megami Tensei were also remade. In the mid-'90s, Atari released a series of remakes with the 2000 brand, including Tempest 2000, Battlezone 2000, and Defender 2000. After Atari's demise, Hasbro continued the tradition, with 3D remakes of Pong, Centipede, and Asteroids. By 1994 the popularity of CD-ROM led to many remakes with digitized voices and, sometimes, better graphics, although Computer Gaming World noted the "amateur acting" in many new and remade games on CD. With the rise of brand new genres and 3D gameplay, remakes became somewhat less common in the late 1990s, with notable exceptions like Doom 64 and Lunar: The Silver Star. Emulation made perfect ports of older games possible, and compilations became a popular way for publishers to capitalize on older properties. Budget pricing gave publishers the opportunity to match their game's price with the perceived lower value proposition of an older game, opening the door for newer remakes. In 2003, Sega launched the Sega Ages line for PlayStation 2, initially conceived as a series of modernized remakes of classic games, though the series later diversified to include emulated compilations. The series concluded with a release that combined the two approaches, and included a remake of Fantasy Zone II that ran, via emulation, on hardware dating to the time of the original release, one of the few attempts at an enhanced remake to make no attempts at modernization. The advent of downloadable game services like Xbox Live Arcade and PlayStation Network has further fueled the expanded market for remakes, as the platform allows companies to sell their games at a lower price, seen as more appropriate for the smaller size typical of retro games. Some XBLA and PSN remakes include Bionic Commando Rearmed, Jetpac Refuelled, Wipeout HD (a remake not of the original Wipeout but of the two PSP games), Cyber Troopers Virtual-On Oratorio Tangram and Super Street Fighter II Turbo HD Remix. Some remakes may include the original game as a bonus feature. The 2009 remake of The Secret of Monkey Island took this a step further by allowing players to switch between the original and remade versions on the fly with a single button press. This trend was continued in the sequel, and is also a feature on the new remake Halo: Combat Evolved Anniversary. The Nintendo 3DS' lineup has included numerous remasterings and remakes, including The Legend of Zelda: Ocarina of Time 3D, Star Fox 64 3D, Cave Story 3D, The Legend of Zelda: Majora's Mask 3D, Pokémon Omega Ruby and Alpha Sapphire, Mario & Luigi: Superstar Saga + Bowser's Minions, and Mario & Luigi: Bowser's Inside Story + Bowser Jr.'s Journey. Games abandoned by the rights-holders often spark remakes created by hobbyists and game communities. An example is OpenRA which is a modernized remake of the classic Command & Conquer real-time-strategy games. Beyond cross-platform support it adds comfort functions and game-play functionality inspired by successors of the original games. Another notable examples are Pioneers a remake and sequel in spirit to Frontier: Elite 2, CSBWin a remake of the Dungeon crawler classic Dungeon Master, and Privateer Gemini Gold as remake of Privateer. Skywind is a fan remake of Morrowind (2002) in the Skyrim game engine (2011). The original game developers, Bethesda Softworks, have given project volunteers their approval. The remake team includes over 70 volunteers in artist, composer, designer, developer, and voice-actor roles. In November 2014, the team reported to have finished half of the remake's environment, over 10,000 new dialogue lines, and three hours of series-inspired soundtrack. The same open-development project is also working on Skyblivion, a remake of Oblivion (the game between Morrowind and Skyrim) in the Skyrim engine, and Morroblivion, a remake of Morrowind in the Oblivion engine (which still has a significant userbase on older PCs). Although remakes typically aim to adapt a game from a more limited platform to a more advanced one, a rising interest in older platforms has inspired some to do the opposite, adapting modern games to the standards of older platforms, sometimes even implementing them on obsolete hardware platforms, either physical or emulated. Modern demakes often change the 3D gameplay to a 2D one. Popular demakes include Quest: Brian's Journey, an official Game Boy port of Quest 64; Super Smash Land, a Game Boy-style demake of Super Smash Bros.; a Flash version of Portal; Rockman 7 Fc and Rockman 8 Fc, NES-styled demakes of Mega Man 7 and 8, respectively; Gang Garrison 2, a pixelated demake of Team Fortress 2; and Halo 2600, an Atari 2600-style demake of Microsoft's Halo series. There is also a NES-style demake of Touhou Project game Embodiment of Scarlet Devil. Some demakes are created to showcase and push the abilities of older generation systems such as the Atari 2600. An example of this is the 2012 game Princess Rescue which is a demake of the NES title Super Mario Bros.
For much of the 1990s in China and Hong Kong, black market developers would create unauthorized adaptations of modern games such as Final Fantasy VII or Tekken for the NES, which still enjoyed considerable popularity in the region because of the availability of low-cost black market systems. ^ "Invasion Of The Data Stashers". Computer Gaming World. April 1994. pp. 20–42. ^ a b Rainer Sigl (February 1, 2015). "Lieblingsspiele 2.0: Die bewundernswerte Kunst der Fan-Remakes". Der Standard. ^ Craig Pearson (2014-01-01). "Ten top fan-remade classics you can play for free right now". PC Gamer. ^ Walker, John (2012-03-29). "You Could Be Playing Dungeon Master Right Now". Rock, Paper, Shotgun. Retrieved 2015-08-03. There is a version that just works, without an emulator, and it’s free. [...] A madman by the name of Paul Stevens spent six months, eight hours a day, writing 120,000 lines of what he calls “pseudo-assembly language” to rebuild it in C++. And then released the game and source code for free. Can he do that? I’ve decided that yes, he can, which legitimises my promoting it to you. ^ "Privateer Gemini Gold 1.02a Review". Macworld. January 9, 2008. Retrieved 2008-06-20. ^ Largent, Andy (March 7, 2005). "Wing Commander: Privateer Remake for OS X". Inside Mac Games. Retrieved 2015-12-17. ^ Owen S. Good. "Fans remastering Morrowind give another glimpse of its landscape". Polygon.com. ^ Beschizza, Rob (August 3, 2010). "Former Microsoft VP brings Halo to the Atari 2600". Boing Boing. Retrieved August 27, 2010. ^ Bogost, Ian (August 1, 2010). "Halo 2600: Ed Fries demakes Halo for Atari". Retrieved August 26, 2010. ^ Agnello, Anthony John (November 19, 2013). "Back from the dead: 9 modern games for obsolete consoles". The A.V. Club. Retrieved December 12, 2013.